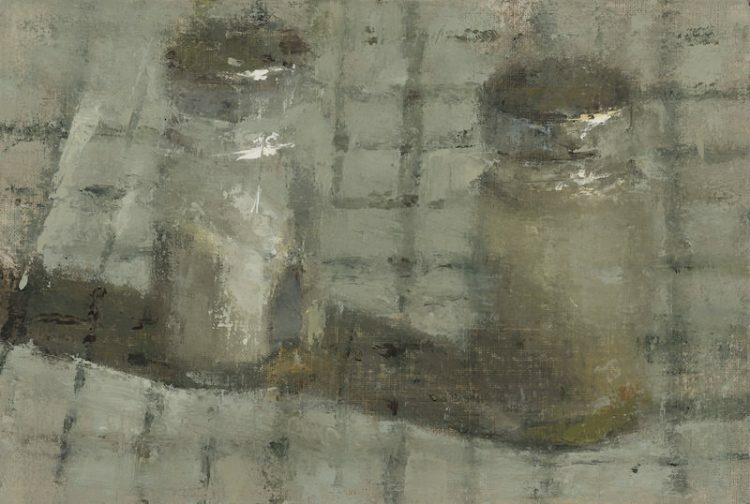 Mark Karnes, Salt and Pepper, oil on muslin mounted on board, 5 x 7 in. Karnes finds his immediate surroundings so compelling, in fact, that when once asked where he was going to travel on his sabbatical, he replied, “Why would I want to go anywhere? Everything that I need is right here.” In Karnes’ experience, all of the restorative aspects of travel-seeing afresh, the renewal of our senses-are available at hand if you can only, like the poet Rilke suggested, have the eyes to see them. Even staying right where he is, Karnes’ still experiences his life as a traveler. 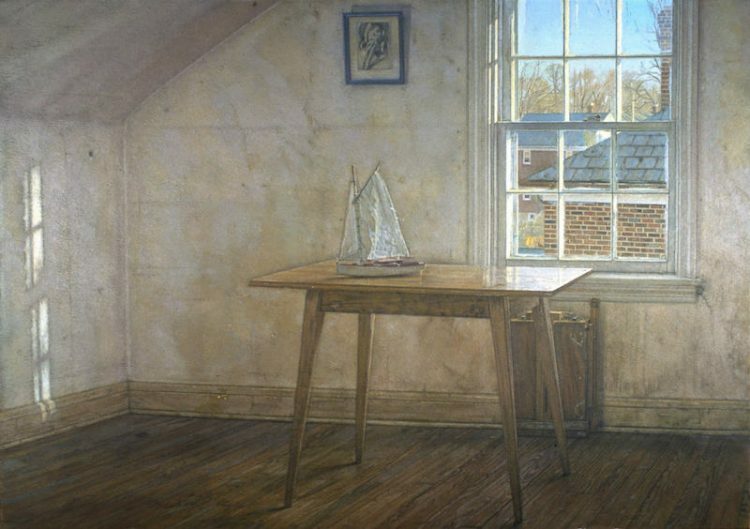 Mark Karnes, Interior with Sailboat, 1989–2005, oil, 24 x 36 in. Interior With Sailboat unwittingly summarizes this attitude. Karnes is, to use poet Billy Collins’ phrase, sailing alone around the room, exploring every cubic inch, cruising every surface and docking in each hollow of this familiar, yet still mysterious, space. This particular voyage is taken in midwinter, when the toy sailboat generally sits in dry dock on the table. The cold winter light, rendered so beautifully in the painting, bathes the attic room that Karnes uses as a studio. The model sailboat-the subtle center-piece of the whole painting-suggests that all is quest, while the beam of direct light, momentarily hitting the far wall, reminds us that time is passing and that the winds will change. The toy, lined up directly beneath a framed figure drawing, also intimates painting’s magical ability to miniaturize the world, to reduce and distili it into something you can hold in your hand. Karnes’ much-used folding French easel, like a piece of luggage packed and ready to go, stands against the wall directly beneath the window, awaiting embarkation. 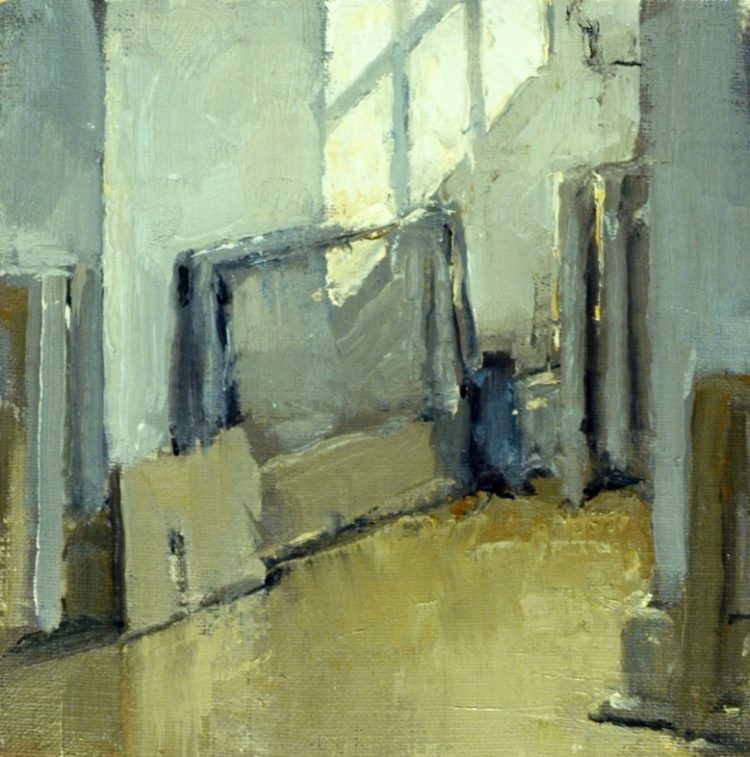 Mark Karnes, Dormer Afternoon Sunlight, 1989, oil on board, 13 x 9 in. Even though this attic space is his main studio, the whole house is fair game for setting up his paint box. Like Vuillard, or the 19th-cenrury Danish painter Viihelm Hammershoi, one senses Karnes prowling the house with a constant eye toward subjects. When an idea for a painting begins to formulate in his mind, pieces of tape begin to appear on the parquet, marking the position of chairs, while heirloom teapots suddenly disappear, conscripted for still-life duty. 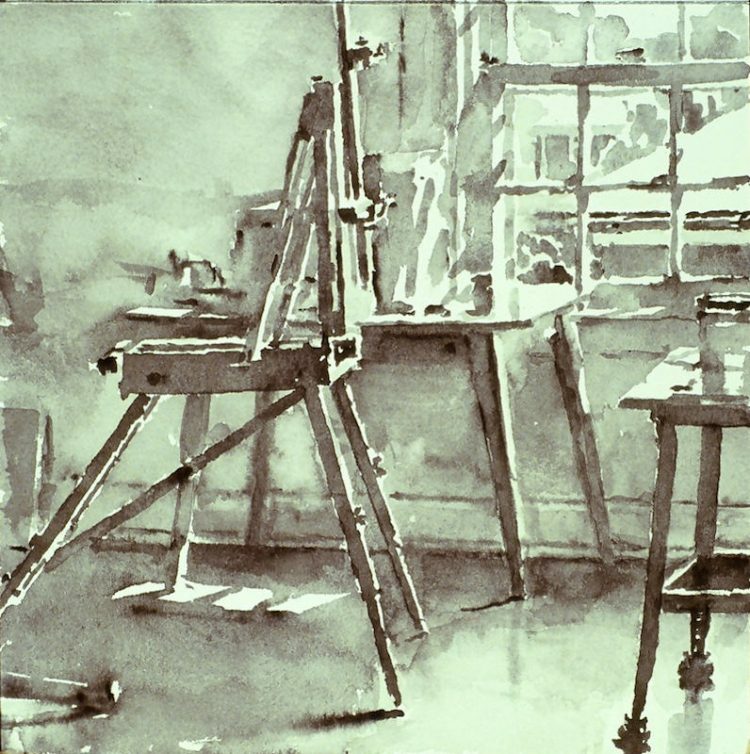 Mark Karnes, Window with French Easel, black watercolor on paper, 5 x 5 in. In recent years, Karnes has gotten into the habit of making tiny black-and-white ink or watercolor studies of scenes that pique his interest. These initial investigations summarize his most powerful visual sensations. In a matter of minutes, they record the major division of lights and darks into big, simple masses. Karnes finds ink and black water-color to be tremendously immediate materials. They shorten the time between seeing the subject and recording it, so he can respond to it with a directness impossible in other media. To this end, he keeps these studies extremely small so that he can give over to the impulse and not have to worry about controlling the structure of a larger work. He can read it all with one glance at the page. 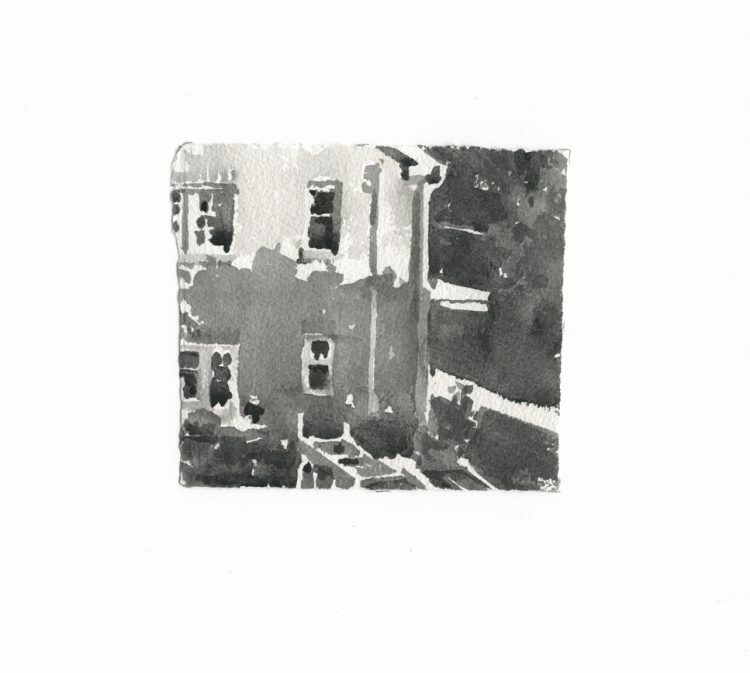 Mark Karnes, Alley Morning, ink on paper, 3 x 3 in. At the moment, Karnes prefers to use black watercolor rather than ink, because with watercolor, he says, “the tones stay closer when they are dry to what they were when they were wet. With ink, the darks tend to lighten as they dry and then you have to go back and rework them. I try to keep it as immediate as I can, with as little revision as possible.” Also, Karnes paints full-spectrum watercolors, so his ease with the medium is an advantage for him. He may do dozens of these little studies before solidifying the idea for the painting. These are not only beautiful works in their own right but they also act as a compass throughout the painting process, ensuring that he never strays from the initial idea. 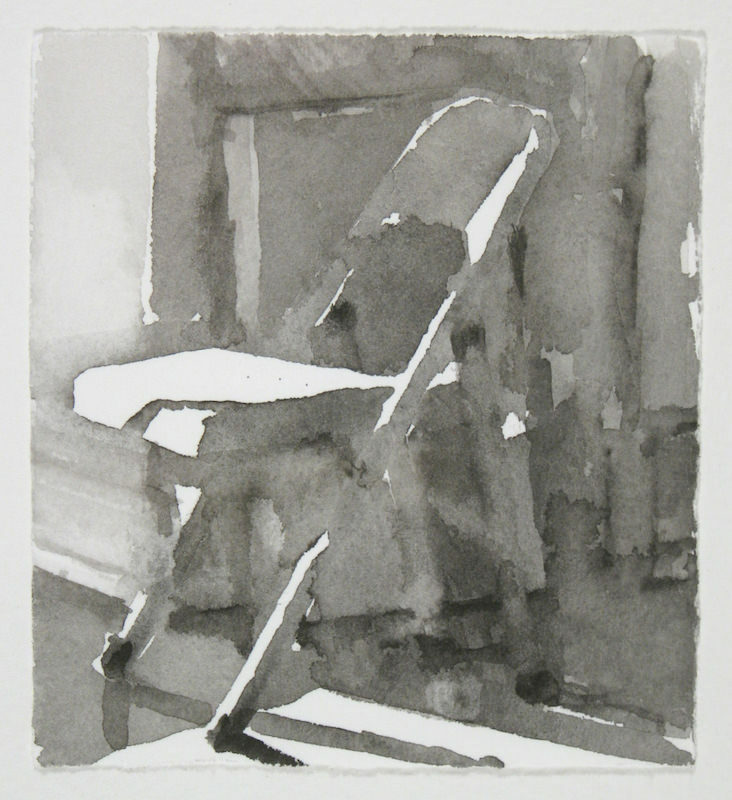 Mark Karnes, Chair with Sunlight, black watercolor on paper, 3 x 4 in. The artist’s assumption that the visual world can best be analyzed in black and white reveals Karnes to be an inherent tonalist. When it comes right down to it, Karnes believes that value-even more than color-constitutes the most fundamental aspect of the visual experience. That being said, Karnes is an exquisite colorist as well, a man whose color thoughts are refined and elegant. In opposition to the color-saturated tidal wave of the zoth century, he understands that color is about relationship, not just volume. His natural tendency gravitates toward winter, when nature is tuned down, and the visual world congregates around a softer center. He often paints studies in oil and occasionally in acrylic as well, and these are equally striking in their immediacy and in how precisely they assay the visual field. These studies are given over to pure observation. In them, he ceases considering what the objects are, and cares only about how they appear, as well as how that appearance can best be translated into the language of painting. Strokes, slashes, daubs-all perfectly calculated and placed-amazingly become buildings, chairs, and beams of light. 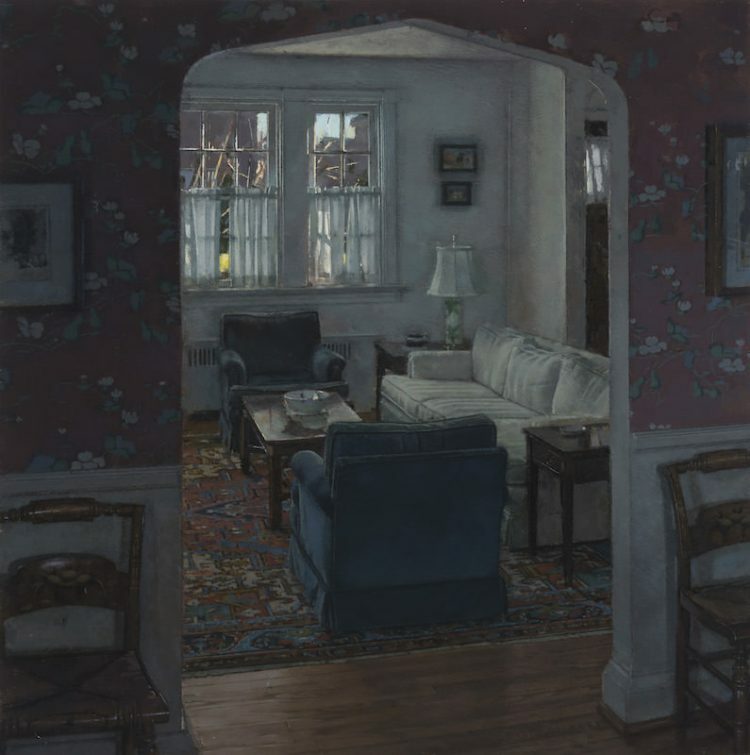 Mark Karnes, Living Room, acrylic on board, 16 x 20 in. 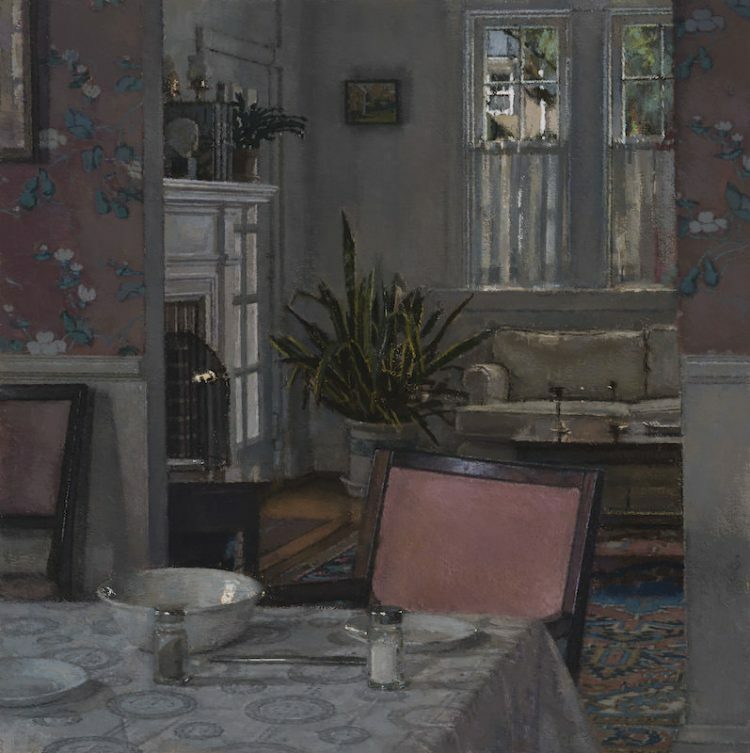 Mark Karnes, Dining Room with Bowl, acrylic on board, 16 x 20 in. The situation was quite different when he went to New Haven to get his M.F.A. at Yale. The atmosphere was tougher and more contentious, and his mentor, William Bailey, was cerebral, whereas Goodman had been intuitive. Upon graduation, he traveled to Italy on a Fulbright scholarship from 1979 to 1980. Although being in Italy and seeing all of its riches were undeniably fruitful for Karnes, his heart ultimately remained at home, and he never returned. A big part of working around his home has been learning to adapt to a great number of different lighting situations. “My house has 30 windows,” observes Karnes. “This means you have to be extremely flexible and adapt to shifting conditions.” Apart from the effect these windows have on his interior paintings, they also afford him a multitude of aerial views of his neighborhood. The views themselves-replete with the shifting configuration of telephone lines and backyard play sets-are ones of everyday suburban reality. In Karnes’ hands, however, the quotidian becomes magical. It is his firm belief that it is the quality of the shifting light that matters. 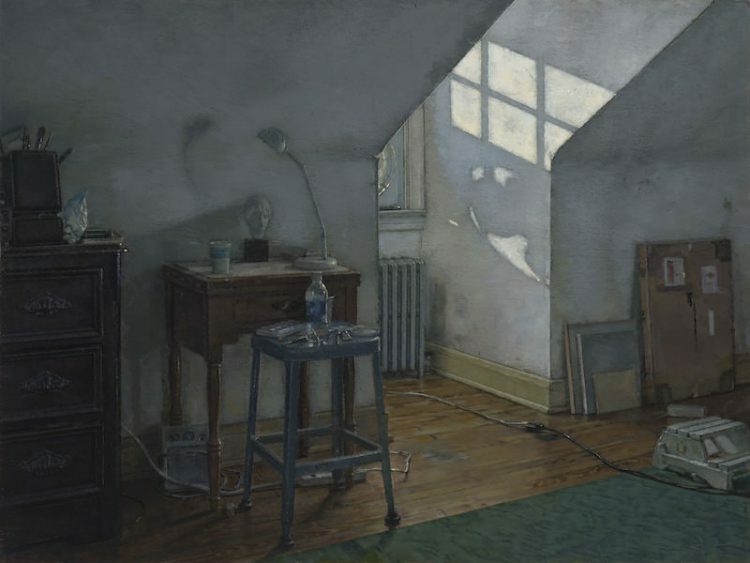 Mark Karnes, Studio, Sunlight, oil on board, 18 x 24 in. The painter Pissarro often talked about searching through different hotel rooms, looking out the windows, trying to find the perfect view. Over the years, Karnes’ vision has become ruthlessly democratic, giving up the idea that there is the perfect view. He has learned to accept and appreciate precisely what is before him, to become the poet that Rilke demanded. He has concluded that it doesn’t matter what the view is. In order to be as free as possible from preconceptions and expectations, he believes that the whole endeavor has to be more open, more arbitrary. “I get in trouble when I try to get too picky about ‘what it is’.” Like Billy Collins, who writes about the life immediately around him-bicycles leaning outside drugstore doors or the morning walk out for milk and a paper-Karnes’ work is steeped in the feeling, and the look, of the everyday. Mark Karnes, Sunlight 1, 2006, oil on muslin mounted on board, 6 x 8 in. Karnes’ openness is reflected in his use of his materials as well. His working method has evolved over the years and is always open to revision and experimentation. Sometimes the artist paints on linen, sometimes on muslin, and sometimes on Masonite panels gessoed with a fine-napped roller. He primarily paints in oil but will occasionally shift to acrylic if he needs the paint to dry immediately as he is working. He uses whatever he needs, just as he accepts whatever he sees, not insistent on finding what he already thinks will be there. 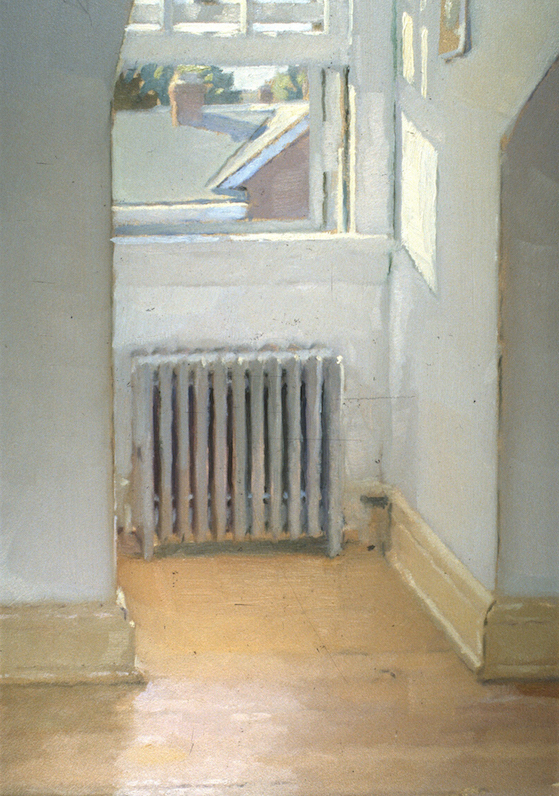 Mark Karnes, Sunlight II, 2006, oil on muslin mounted on board, 6⅛ x 6⅛ in. Karnes’ sketches are generally painted alla prima, while the more finished paintings develop slower. For them, he usually starts out with a surface toned with a neutral raw-umber wash. 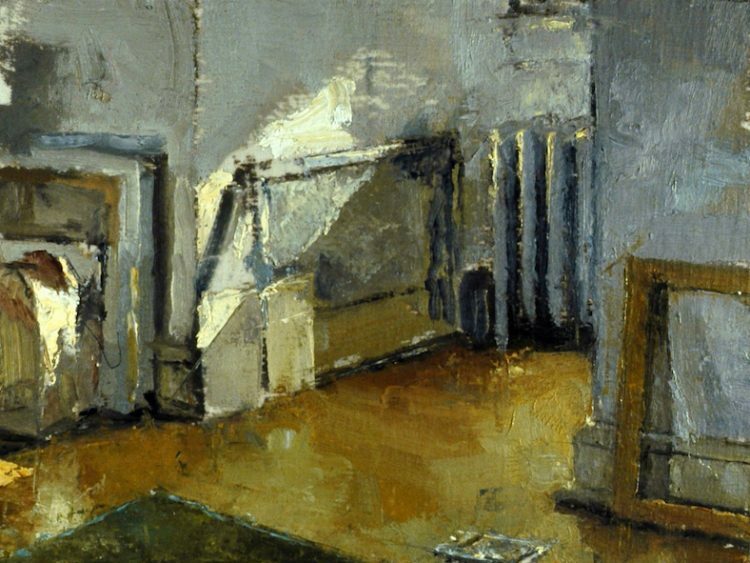 Even with the most complicated pieces, such as Interior With Sailboat, the artist starts out with almost no preparatory drawing. What is of interest to him at the beginning is the large division of light and dark. He then starts to introduce temperature changes, thinking about what parts of the light are warm and what parts cool. At any given point, he does only as much drawing as he needs to help him place the color. Only toward the end does he pin down the very specifics of the drawing. This ensures that the painting is always primarily about tone, color, and light, rather than the ostensible subject. 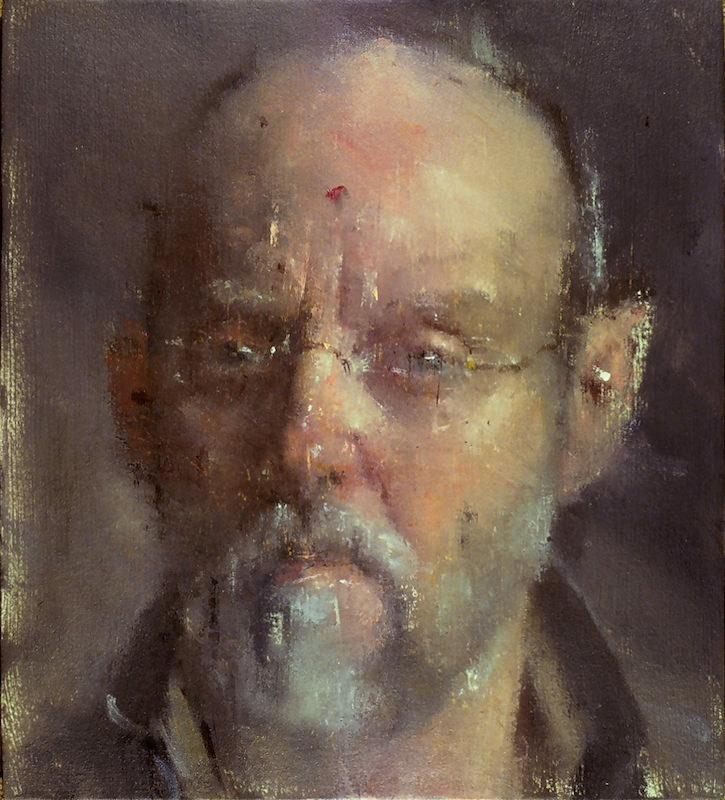 Mark Karnes, Self Portrait VI, oil on board, 6 x 5 in. Karnes holds to this belief in the primacy of light even when painting the object that he knows best and that is closest at hand: himself. He has recently been painting a series of self-portraits in which he brings this same level of detachment to bear on his seeing. In most artists’ self-portraits, the painter uses the mirror merely as a tool for seeing the object they really want to paint: themselves. Think of Rembrandt’s monumental late self-portrait in The Frick Collection, in New York City, in which Rembrandt is miraculously there in front of you, his form so palpable that you feel you can reach out and touch that beloved face. But with Karnes, you don’t get that palpable reality; you get the shadowy reflection of his image in the mirror. Most artists do away with the mirror to get at the self. Karnes is intent on giving you the mirror, the fleeting world of reflections and shadows. It’s just that he happens to be in the mirror at that moment. This represents an allegiance to seeing of the highest order. It speaks of a life’s commitment to respect the primacy of observation, even if it is the most private self that is at stake. Originally published November 2007 in American Artist.